"This kid-friendly sandwich is yummy and easy to make for lunch and snacks. Sort of in between a grilled cheese and a Monte Cristo." Spread cream cheese on two slices of bread. Layer 2 slices of ham, 2 tablespoons of pineapple, and one slice of cheese over the cream cheese. Then top each sandwich with one more slice of bread. Cut off crusts. In a shallow bowl, whisk together eggs, milk and sugar. Briefly dip both sides of sandwiches in egg mixture. Heat butter and oil in a large skillet over medium heat. 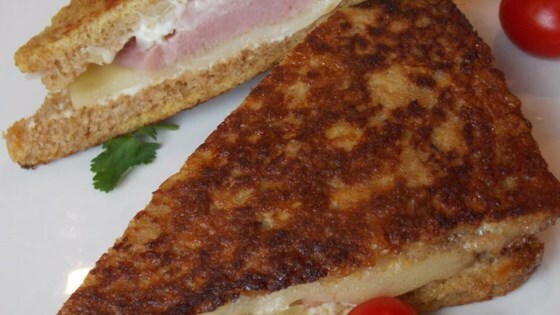 Place sandwiches in skillet, and fry on each side until golden brown and cheese is melted, about 5 minutes per side. Drain on paper towels and cool for 3 minutes before serving. These were fine. I am not sure if it was worth the calories but I am glad I tried them. Thanks!